If you or a friend are planning to travel to Europe this summer, I’m pretty sure you’ll appreciate any advice to help make your travels go smoother and safer. Europe is one of the busiest places for tourists over the summer months, so hopefully you’ll find these tips helpful! Let me know if you agree, disagree or would add anything to the list below. And please feel free to share this with any friends, family or colleagues who plan to travel to Europe this summer! If you’re planning to travel out of the country this summer, now is the time to find your passport and make sure it’s valid. Remember that many countries require that your passport be valid for at least six months (some just three months) after your arrival date before they’ll grant entry to their country. It doesn’t matter if you’re only going for a day; if you don’t have at least six months validity, you could, and probably will, be denied entry. Here’s how to renew or apply for a passport. For more, here are 10 passport tips that will save you time, money and headaches. One of my top three travel tips is to pack light. Trust me: It will make your travel experience so much easier. When my then-girlfriend, now-wife, showed up for our first trip together, which was just a weekend trip, she looked like a 1920s transatlantic passenger with the size of her trunk! I had to put on the brakes and show her the light. I used to pack the same way but I learned the benefits of traveling light, like not having to pay for checked luggage, not having to show up early to the airport, not having to stand in long lines to check your bag or stand around for what seems like an eternity for your bags to come out at baggage claim (if they ever do). You also don’t have to worry about the airline losing your bag, and you’ll be able to switch to an earlier or non-delayed flight more easily and you can take public transportation to get around, which is usually faster and cheaper – especially in Europe. Now, Natalie packs lighter than I do (here’s her packing guide) and when I suggest she should check a bag for one of our round-the-world trips, she looks at me like I’m crazy. All I take is a Briggs & Riley rolling bag, which has my valuables and work supplies (laptop, tablet, chargers, etc), along with a medium-sized Roots tote bag with clothes for a week. I’ll find a place to wash my clothes when my trips are longer than seven days, which they usually are. If you think you might do a fair bit of shopping on your travels, then pack a thin, lightweight duffel bag in your carry-on or checked suitcase. That way, if you have too much stuff, you can check an extra bag on the way back. TIP 2: If you purchase expensive items, then put your dirty clothes in the checked bag and carry the more valuable items on the plane. The best way to combat jet lag is to get on the local schedule as soon as possible. I usually start doing this the day before I fly by going to bed early, and the moment I get on the plane, I set my watch to local time. I then try to sleep and eat at the times they would be doing so at my destination. If you take an overnight flight and don’t get much rest, don’t go to sleep when you arrive. Instead, fight it. Try and stay awake until at least 10pm so you can get on local time as soon as possible. FYI: Here are 10 tips for getting some sleep on a plane. Tell your bank and credit card company before you leave on your trip that you are going out of the country. Let them know the places you are going and the dates you’ll be away because after all of the credit card hacking, they will put a block on your card(s) immediately and this can put a real damper on your trip. So make a quick call in advance to avoid this hassle. Note: Using the company’s website doesn’t always work; my wife set a travel notification online with her CIBC account (a Canadian bank) and they still blocked her card. When she called the representative, she was told it’s much better to call than to register online.Here’s our list of credit card partners — be sure to get one with no foreign transaction fees and a chip and pin. One of the biggest scams I find major stores committing overseas is after they swipe my credit card and it registers as U.S., they try and make it sound like they are helping me save money when they say, “Oh, would you like to pay in U.S. dollars or euros/pounds (or whatever their local currency is). Paying in U.S. dollars would seem to be the more convenient option, but in reality, it’s not. In fact, it’s a total rip-off, since the stores that do this charge a higher exchange fee than your bank back home does. So, remember to always pay in the local currency of the country you’re in! Before leaving the country, it’s always smart to check with your bank to see what ATM fees to expect. “When you use a foreign ATM, you could be charged a variety of fees, including non-bank ATM usage fees, ATM operator access fees, and international transaction fees for conversion to U.S. dollars.” That quote is directly from Bank of America, which goes on to tell its customers, “one way to limit such fees is to use your Bank of America ATM or debit card at one of our international partner ATMs. This enables you to avoid the Non-Bank of America ATM $5 usage fee for each withdrawal, transfer or balance, as well as the ATM operator access fee.” Here’s a list of Bank of America’s partners. To find your bank, just search their name and international ATM partners. These days, you rarely have to worry about not being able to communicate overseas. People always think I speak multiple languages because I travel so often and don’t have a difficult time doing it. Sadly, I only speak English and I’m not even very good at that. However, I’ve noticed that more and more people are speaking English in the past 10 years (especially the younger generation). During all my travels, I only once ran into a problem not speaking the local language and that was in China. But since then, there’s been a whole slew of technological innovation, including the Google Translate app. It’s free to download and can translate over 90 languages, from Afrikaans to Zulu. The app has an integrated the Word Lens app so travelers can translate any text including street signs and menus just by holding up their camera: English to-and-from seven languages: French, German, Italian, Portuguese, Russian, and Spanish. Google is working to add more … all without an internet connection. The translation is suddenly overlaid on the phone screen, just like that. Before you start using all of your apps, make sure your cell provider won’t bankrupt you. Before leaving on your trip, call your provider and ask them if you are covered for the countries you are traveling to. If not, either turn your phone off or put it in airplane mode and just use WiFi. If you have T-Mobile, chances are you will be able to get free data and inexpensive phone calls ($0.20 a minute). If you are cruising, follow this advice. This tip was left by reader Orit R. from Israel, who says: “I just had friends come back from the Czech Republic where they had bought bus/tram tickets. As in most European countries, this kind of transport works on the honor system, in which you must endorse [validate] your ticket when getting on the transportation. My friends thought that since they’d bought the tickets, they were okay to go. Well, the transport ticket police got on their bus and were checking all the tickets and when one of them got to my friends, he saw the tickets were not endorsed. My friends tried explaining that they were tourists and didn’t understand the language, but that didn’t help. They were ‘off-loaded’ at the next station and taken to the police station, where they received a hefty fine. They were on their way to a prepaid tour, and of course, due to time they missed their tour.” Many European countries have this system so don’t forget to validate your bus/train/boat ticket if it’s required. 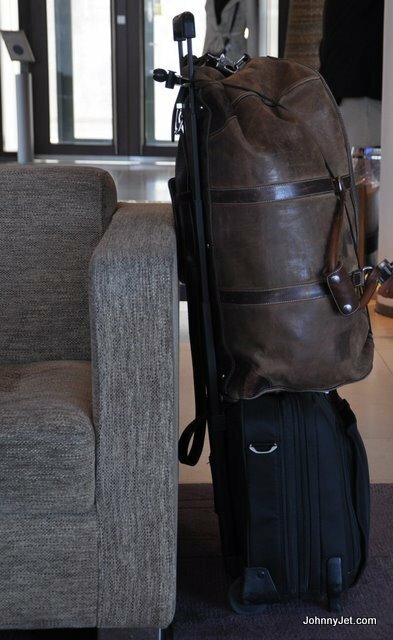 39 Comments	On "12 Things to Know Before You Travel to Europe"
Another tip when it comes to hand luggage, make sure you don’t have too much. Airlines in America have more hand luggages allowens than the European airlines. The “trolly” suitcase have to fit in under the seat in front of you and on most airlines you are only allowed to bring one carry one. Not one trolly bag and one back pack, but only one carry on in total. If you travel on low cost airlines, like Ryan Air, read all the information in advance, too much luggage will cost you tons of money (just one of the 100 reasons why I don’t fly Ryan Air or many other low cost airlines). That move by the police in the Czech Republic reminds me of some police departments in rural areas of Pennsylvania who target drivers from out of the area with speed traps, knowing that they will usually pay fines without making a fuss. This is a major source of revenue for some of the police departments. Your tip about making sure your passport is still valid for 6 months after you plan to travel is a very important one because airlines do not consider it their responsibility to tell you this. I had a friend who was denied boarding for a trip to Europe because she did not know this. Also, it is important for travellers to take responsibility for knowing the visa requirements for anywhere to which they are traveling. Again, it is important to do your own research. When booking a cruise for Southeast Asia, I was once given incorrect visa information by the cruise line. Fortunately, I had done my own research and found the mistake before it was too late. I’m a Canadian, and I’ve only been pulled over for speeding once. I was going 57 in a 55 in Beaver Springs, Pennsylvania. Those PA cops are dicks when it comes to out-of-towners. Some reputation they’re building for that state, lol. European airlines have different carryon bag rules so be prepared. We just got back from Europe. We we’re shown compassion by the conductor for un-validated train tickets. We also saw the “pay with Canadian Dollar” on our credit cards in Switzerland. Finally for any Canadian travellers – consider dealing with “Tangerine” online bank. They have no service charges on withdrawals from several European bank ATMs belonging to Scotiabank Global Alliance. We travelled with first class rail tickets and just loved the speed and comfort. First class was not much more but well worth it! It was a real step down getting back on a transatlantic flight home back in economy class. Good tips but the article isn’t really related to Europe. The tips are very general. My main tip for travelling to Europe is to learn some basic of the language you’re travelling in. You’ll be greeted with smiles in stores etc and you won’t feel like a tourist. Very true! When we went to Mexico I used as much Spanish (poorly) as possible and the locals really appreciated it. Remember you are visiting their country. Nowadays many European cities use smart cards for public transport. It’s a good idea to google in advance what kind of cards are available and what’s the best option for your visit — and most importantly, how to load money on them. Buying single, old fashioned tickets is usually the most expensive way to travel and they may no longer be available at all. It’s also worth checking if the country has easily obtainable prepaid SIM cards. In some countries you’ll get an unlimited data SIM card for something like 20€ for a month that makes using Google Maps and other apps a lot easier. Next should be the 12 things to know after you arrive in Europe. Better option on foreign ATMs that trying to avoid the typical big bank charge (aka the $5 non Bank of America ATM charge) is use a smaller bank or credit union for your banking. My credit union rebates up to $10 per month that a foriegn bank may charge and doesn’t add a fee of its own! I would also add a “heads-up” about low cost carriers and different countries. I travelled all over SEAsia on Air Asia with a single day style backpack/laptop bag (easily fits in overhead compartment) and a shoulder bag. They were pretty heavy, but no worries, no measurements. They seemed pleased I had so little. Now I live in Australia. I recently took a Jetstar flight w/my business wheelie bag and a small laptop backpack. During boarding, they brought out a scale and weighed everyone’s carry-on. I was going away for 6 days. I had 4 shirts (it’s winter here! ), 2 pants, workout shorts & shirt, 3 changes of underclothes (bras, undies, sox), bikini, flip flops (for the pool/spa) and running shoes. The limit is 7 kg. I was at 9 kg including my laptop bag. I was charged $50 at the gate, and $23 by booking my bag on line for my return trip – for a regulation wheelie bag! It may have seemed like a cheap fare at the time, but BUYER BEWARE. Know your limits and how stringently they’ll enforce them! Great tips on traveling to Europe, but I had a couple questions about your travel bags. In particular, which model of the Briggs & Riley rolling bag do you use and have you had any problems stowing it under the seat, especially on smaller commuter planes? I am in the market for such a bag, but am concerned about getting a bag that will fit on those smaller planes. I live in Montana and many of our flights have migrated to the smaller commuter planes. Thanks! Without checked luggage how can I take manicure scissors, toothpaste, hair goop, lipstick, liquid makeup, suntan lotion, etc. i know you can buy things in other countries, but it is not the first thing I want to do. Thank for d wonderful tip…i will surely follow ur advice. Thanks for the tips before traveling to Europe! I will be going to Europe again soon, and I will have to make sure to use all these tips when planning my trip and while I am there. Also, for other travelers, checkout my 12 Tips for Cheaper Travel at my travel blog! — Cheers! If you follow only these 3 tips you could save a lot of money. All great tips – thanks Johnny! For no ATM or bank fees, I love having a Charles Schwab account. Amazing! Thanks for sharing this useful article, it’s very important to know the most things can help us to visiting Europe. Before leaving the US, try to get a “Chip and Pin” credit card rather than the “Chip and Sign” variety that US banks are still using. There were multiple ticket vending machines in European countries that only work with “Chip and Pin” for selling transport tickets. For my latest trip (June 2016) I had gotten a BarclaysCardUS from Johnny’s recommendation which was a “Chip and Pin” and it really worked! Be sure to scan your passport and email the scanned image of the passport (and visas) to yourself and partner(s). In case of loss, you have proof on your smartphone of your passport. Buy bright colored luggage. Due to liquids, I had to check through a bag to Prague. When it didn’t arrive, it helped that it was a bright yellow Hilfiger luggage that stood out for the airport personnel to find in a room full of black luggage. Once arriving in Moscow, the lights went out and it was much easier finding that bag on the conveyor belt due to its bright color. For that matter, bright colored smartphone covers, backpacks, etc., stand out and are less likely to be forgotten in a dark restaurant or hotel room. Bring a small tube of detergent with which to wash your clothes in the hotel sink. In Europe, the wash machines take forever for one load, but the dryers can be fast. If you wash your clothes in the sink with detergent, you can save a lot of time by drying them in a “Wasch Salon” – usually less than 30 minutes. A wash cycle in a European machine is sometimes longer than 90 minutes! When renting a car in Europe, be sure to photograph the car from all angles as proof of its condition at the time of pick-up. Most European car rental companies thoroughly inspect the car upon return and your pictures can document any discrepancies. If you are not adept with a standard transmission car, practice with one in the states before you go to Europe as many rentals there are standard transmission. As a safety matter, learn how to shift a standard transmission car in case you are stranded somewhere (perhaps with a drunken driver) and a standard transmission car. In Europe, many cities have excellent public transportation systems that offer touristic routes without the cost of a touristic “hop on-off” bus, for example. In London, you can see everything on the Bus #23 which runs from Westbourne Grove to Liverpool Street – past all the big sights – for the cost of a regular Tube fare! In Paris, take the “Bateau Bus” on the Seine, or in Hamburg, the Finkenwerder Ferry Line #62, which is actually a harbor tour. Yes! Rental Car company’s, not just the brands unfamiliar to Americans, but Hertz, Avis, etc. are really really picky about damage to their cars. absolutely photograph everything before departing! On returning the car, they will do a very thorough inspection (unlike anything I ever experienced at USA airports). Good information, I found out about the self validate train tickets in Norway, almost got on the train but saw some people putting their tickets in a machine so I checked and that is what it was. Good to know in advance. Plus in most places in Europe now you’ll need a chip enabled credit card to use it. Most U.S. banks are switching to this now though. Also in Austria our bus driver got a speeding ticket for being 2 KM over the limit, came around a corner into a town off the highway and speed limit changed suddenly but he couldn’t slow down fast enough. Police made him pay on the spot. Said the new system is an online camera and once it registers a violation, no matter how small, you MUST pay the fine. Also, saw this tip yesterday for international travel and using your phone and data overseas. I’ve spent a fortune on roaming packages. This sure sounds like the way to go. Of course, get travel insurance…. Also get on a government travel list to always know where you are going doesn’t have ban on travel that may affect your travel plans (for me this was areas in Kashmir recently). London buses take contactless credit cards now, they DO NOT take money. Don’t constantly compare your country to the country you are visiting (out loud at least) it gets old. When you go in a small shop in rural France say bonjour as you enter, it’s a tradition. Enjoy the differences! (I’m American, living in England for the last 16 years). Try to stay in UK university rooms when students are gone, good deals…. I’m a little bit confused about the tip regarding paying with local currency. I have never traveled internationally, so please excuse my ignorance, but I figured I might as well get clarification ahead of time. You said that once your card is swiped, you are then asked if you’d like to use local or U.S. currency. But if the American card is already swiped, wouldn’t it automatically use U.S. dollars? How does one elect to use Euro or whatever the currency is? A screen comes up after you swipe asking if you want your own or the country you are in currency. It is also to do with the exchange rates as well as fees. If you choose pay in local currency then you will pay the exchange rate on your card when it is processed to your statement which could vary day to day. In turn this can increase any transaction fees charges by the bank. It is usually not a great deal of difference but it all adds up if the exchange rate is not in your favour. Just back from three weeks in Europe and still have no clue how I could have done it without a check bag. Are you only taking the shoes you are wearing? I need at least two pairs. One for business/evening and one for working out/walking. With size 13 shoes, the pair I am not wearing takes up most of a carry on. Then when I have to have a suit with me as well as daytime wear and workout gear…how do you fit that all in. I also have to have my electronics bag as you do. I love my Lowepro bag that fits my Nikon D810, two additional lenses, my iPod Pro, my 15″ MacBook Pro and all the cords for all of those. Light as a feather (unlike my old Briggs and Riley) when empty and still manageable when full. The upside being I did not pay to purchase currency,or get left with any useless currency or lose on exchanging back. The credit card international transaction fees were a few cents. I also tend to check if you can drink the water. In many countries the water is drinkable, but only to locals. And the quality varies per region. So if they put some icecubes in your glass and you aren’t used to the water then you could end up with diarrhea. A bit of research saves having to pack some extra underwear. The ATM fee recommendations are a little outdated. Look into online banks with no atm fees. It would be interesting to hear your views on how much cash to bring as well as how to use wifi safely when abroad. The U.S. Embassy and/or Consulate in the European nation (s) you are traveling in will issue a Travel Warning when they want you to consider very carefully whether you should go to a country at all. Examples of reasons for issuing a Travel Warning might include unstable government, civil war, ongoing intense crime or violence, or frequent terrorist attacks. We want you to know the risks of traveling to these places and to strongly consider not going to them at all. Travel Warnings remain in place until the situation changes; some have been in effect for years. Also, the U.S. Embassy and/or Consulate will issue a Travel Alert for short-term events they think you should know about when planning travel to a country. Examples of reasons for issuing a Travel Alert might include an election season that is bound to have many strikes, demonstrations, or disturbances; a health alert like an outbreak of H1N1; or evidence of an elevated risk of terrorist attacks. When these short-term events are over, we cancel the Travel Alert. Some of this is very helpful but dont know how true this is about your friend as i am from Europe and can confirm that there is no way your friend got arrested for not validating there ticket…. they may have been asked to pay for another ticket and then became abusive and got finedfor that as the police take no part in checking tickets on buses this is the job of a ticket inspector. Transport police are used for abusive or drunk people that may cause trouble. Yes validate your ticket by all means as you may have to pay an extra fare but please dont go there with your back up because someont told you online you would be arrested for this. This is europe we are talking about not the middle east.